Both armies advanced at each other just after dawn. 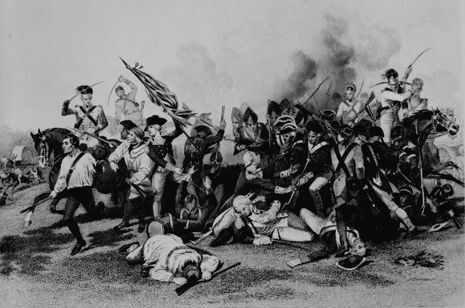 The British troops opened the battle, when the right flank fired a volley into the militia regiments, causing a significant number of casualties and then launched a bayonet charge. The militia, lacking bayonets, fled before the British regiments even reached them. Only one company of militia managed to fire a volley before fleeing. The panic quickly spread to the North Carolina militia, and they fled. Seeing his left flank collapse, Gates fled with the first of the militia to run from the field. Within a matter of minutes, the whole rebel left wing had evaporated. While the militia was routing, and before Gates' flight, he ordered his right flank under de Kalb to attack the opposing British militia forces. Rawdon's troops advanced forward in two charges, but a heavy fire repulsed his regiments. The Continental troops launched a counter attack which came close to succeeding and Rawdon's line was beginning to falter. Cornwallis rode to his left flank and steadied his men. Instead of pursuing the militia and repeating an event similar to the Battle of Naseby, Webster wheeled around and launched a bayonet charge into the left flank of the Continental regiments. The North Carolina militia that had been stationed next to the Delaware regiment held its ground, the only militia unit to do so. The Continental regiments fought a stiff fight for some time, but only 800 Continentals were facing over 2,000 British troops. Cornwallis, rather than fight a sustained fight with a heavy loss, ordered Tarleton's cavalry to charge the rear of the Continental line. The cavalry charge broke up the formation of the Continental troops, and they finally broke and fled. De Kalb, attempting to rally his men was shot eleven times by musket fire. After just one hour of combat, the American troops had been utterly defeated, suffering over 2,000 casualties. Tarleton's cavalry pursued and harried the retreating Continental troops for some twenty miles before drawing rein. By that evening, Gates, mounted on a swift horse, had taken refuge 60 miles away in Charlotte, North Carolina. In January 1780 Major General Clinton who had taken over as British commander-in-chief in America from Major General Howe took a force from New York and captured Charleston, the provincial capital of South Carolina. Storms caused substantial loss of guns and horses on the journey. Clinton returned to New York leaving to Major General Cornwallis the task of capturing the rest of South Carolina. On 18th May Cornwallis sent Colonel Banastre Tarleton with foot and light dragoons in pursuit of an American force commanded by Colonel Burford. Tarleton overtook Burford at Camden near the border with North Carolina and defeated him. Cornwallis arrived at Camden which over the next few months became an important base of operations for the British and in which supplies were assembled. 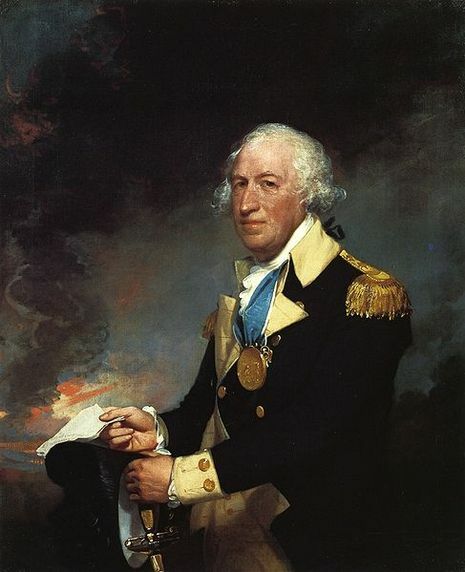 In July an American army under Major General Horatio Gates had marched from the North and was threatening the British in South Carolina. The British were commanded at Camden by Lord Rawdon, Cornwallis having returned to Charleston. Rawdon advanced from Camden to meet the Americans and took a position on a creek to the North-East of the town. On Gates’ approach Rawdon fell back to Camden. On 14th August Cornwallis joined his troops in Camden with the determination to attack Gates. He made a night advance which collided with the Americans who were also advancing to make an assault. The battlefield lay between two swamps which narrowed the front and secured the flanks. Cornwallis formed his army in two brigades, Colonel Webster on the right with the companies of Light Infantry, the 23rd Royal Welch Fusiliers and the 33rd Foot and on the left Lord Rawdon on the left with the Irish Volunteers, Tarleton’s infantry and some loyalist provincial units. Two battalions of Fraser’s 71st Highlanders provided a reserve. Gates drew up his army with the regiments of the Continental Army on the right under Gist, Kalb’s 2nd Maryland and a Delaware regiment, his centre under Caswell of North Carolina militia and his right under Stevens of Virginia militia. Smallwood commanded the reserve of the 1st Maryland. Gates ordered his left wing of militia to attack the opposing British units. As they began to move forward the British launched a counter attack along the whole line. Ill-trained and largely without bayonets with which to conduct close quarter fighting, the American militia retreated off the field leaving Webster’s regiments to turn on the flank of the American right wing where the Continental units were putting up a stiff fight and continued to do so for some time. Tarleton’s cavalry finally attacked the American right wing in the rear causing the units to break. The British cavalry pursued the retreating Americans for some twenty miles. Gates, the American commander appears to have left the battlefield with the first of the militia and ridden a considerable distance before drawing rein, leaving his subordinate commanders to fight on with the right flank. His reputation was destroyed. Baron Von Kalb, a German in the American service, particularly distinguished himself before being killed.